I’ve been tinkering with the idea of bike packing for a while. It looks brilliant for a start, all that fancy luggage and those beefy trail hungry bikes. Bike touring for extra rugged types, count me in! The luggage ain’t cheap, so after deciding that this might be my new passion, I started collecting bits, and then did a mini mountain bike tour back in the summer on easy trails around Ben Alder. All this was building up to the big one, two weeks in the mountains of Crete in October. So now I’m back, and I have the benefit of hindsight. Here’s what I have learned. Adventure Bike, my go anywhere, do anything bike. 1. Start With the Bike. It’s a no brainer really, if you’ve got a big trip planned, start with thinking about how your bike needs to be set up. For Crete, we knew we would be riding a mixture of tarmac and unsealed agricultural roads with lots of height gain every day. Tracks can be rough and thorny. I’m lucky to have a choice of bikes (n+1 anyone?) and decided that my Adventure Bike would be the most comfortable ride for this trip. It’s fairly light, with a tough aluminium frame, strong wheels, and we fitted brand new Schwalbe Landcruiser tyres to keep those thorns out (which they did, with zero punctures in 2 weeks of riding). Adventure Bike has a triple chainset but with my lack of training, I knew the hills would be my nemesis. I decided that I wanted to bring as little luggage as possible, staying in rooms and hotels along the way. This was a good call as the hills were massive, so I got this bit right at least! However, some aspects of my bike weren’t ideally suited to the luggage I wanted to carry. More on this later. Meanwhile, Wally was riding an adapted Scott mountain bike and had even friendlier gears on the hills, but he compromised with less performance on the rare tarmac flats. Fully loaded and adventure ready. The point of bikepacking luggage is twofold. Firstly, by distributing the weight around the bike in small packages and using frame bags, it’s possible to keep the centre of gravity low and close to where the rider sits. This is great for rough trails and technical terrain. Secondly, in theory, it is also a lot more aerodynamic than bulky panniers clipped on to a bike rack. I bought a secondhand half-frame bag from a pal, to optimise that centre of gravity benefit, but I quickly realised that it made using my bottle cages awkward. I knew water could be an issue in the dusty heat of Crete so carrying plenty of water would be essential, but no bother, I excitedly purchased an adapter kit that allowed me to fit my bottles to my forks. My bike now looked awesome, and like a proper Adventure Bike! My delight lasted until my first headwind, when I discovered that fork mounted bottle cages are a bit like sails. Great with a tailwind but rubbish in a headwind. My sporty bike with drops and a relatively tucked riding position was transformed in to a plodder. The perfect bread carrying solution? 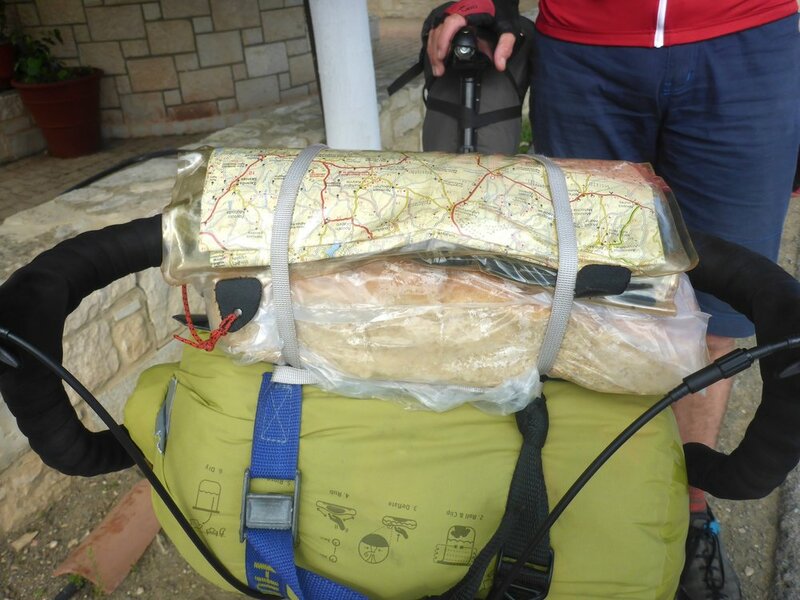 As we got the hang of things, Wally’s handlebars became the perfect place to store fresh bread and delicious Cretan pies, snuggled safely between a map case and his bar bag. To be honest though, from the word go, our gear was definitely a bit DIY… Proper bikepacking luggage is gorgeous and exciting but also very expensive. My set up ended up being a bit of a mishmash of off the peg luggage (love the Koala 13 from Alpkit), and bits cobbled together from drybags and assorted straps that we collected in the run up. I strapped a drybag to my handlebars using segments of alkathene water pipe (thanks to a plumber friend), to hold it off my bars and leave space for my hands, (I bought an Alpkit Joey handlebar harness to help with this). I carried a small roll of gaffer tape, which I regularly applied to protect the bag from an exposed section of brake cable. At the last minute before we left, I found an old lens pouch for a camera which strapped on to my bar bag and could be filled with snacks, and a luggage strap that held my flipflops on to the saddle bag, so that I was always beach ready! I left my dummy run until too late, and discovered that my number one problem was going to be the interaction of my bar bag and my road style gear levers on my drop handlebars. Adventure Bike has narrow profile Bontrager bars, designed for women and other people with small hands, which I absolutely love, and have improved my confidence when descending. The massive down side which I had not appreciated until I was in the thick of it, is that if you strap a bulging bar bag to them, you can’t easily use the gear shifters. This was a particular issue from my front (left) shifter which needs more room to travel than the right. Getting the set up right so I could push the levers required lots of trial and error every morning, pulling on the straps to deform my bar bag to exactly the perfect dimensions for my gears to work. This was intensely annoying, for my companion as well as me (I swore and grumped about even more than usual in the mornings) and I’m keen to hear from anyone who has solved this problem. The daily kit faff before we can set off. Which brings me to the thing I really hadn’t appreciated. Panniers fitted to bike racks are easy. They are big buckets of happiness ready to accept whatever kit you throw in them. It doesn’t really matter what order your gear goes in to a pannier because you can always have a rummage about later. In contrast, bike packing luggage is a total faff. The bags are smaller, and odd shaped things like tools or guidebooks will only fit in certain places. Some of your gear is going to be totally inaccessible all day without dismantling the entire set up, so packing requires planning. And then each bag needs fitted and tensioned perfectly to withstand the bumpy ride it is going to get on those fun trails. I’ve realised that although bikepacking gear definitely looks the epitome of rugged adventurousness, if I know I’m only going to be on tarmac, I’d much prefer to tour with panniers and a bike rack. That said, a bikepacking set up really is superior on rough and technical terrain. 6. There’s No Such Thing as the Perfect Set Up. I’ve been doing lightweight trips on foot for decades and I am still constantly honing and improving my gear. I’ve come to realise that in this respect bikepacking set ups are the same. What works for one person, on a particular journey, will not work for another, and tinkering on the road is also absolutely going to happen. I’m looking forward to hanging my nose over other people’s set ups, and if anyone reading this has some top tips they’d like to share, I’m all ears.